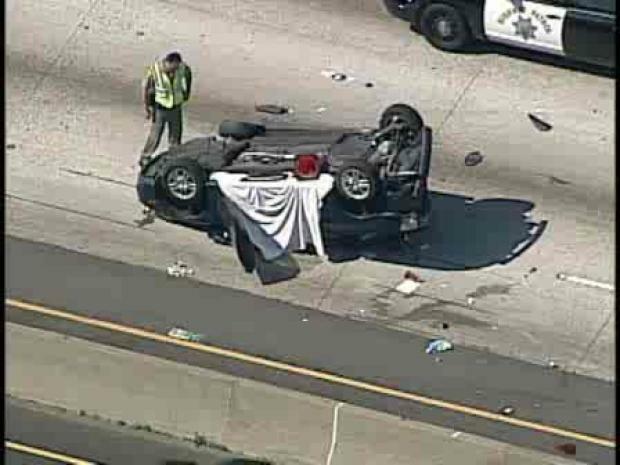 A man was killed in a rollover crash on the Santa Monica (10) Freeway in the Arlington Heights area Monday, forcing the closure of three lanes of traffic and snarling traffic at the beginning of the afternoon rush hour. The 45-year-old man, who was not immediately identified, died at the scene of the rollover crash, which was reported on the eastbound freeway near Arlington Avenue shortly before 2 p.m., said Officer Anthony Martin of the California Highway Patrol. CHP officers temporarily shut down three lanes of the freeway between Arlington Avenue and Sixth Street while the investigation continued, backing up traffic for miles. The cause of the crash remained under investigation, Martin said. One person was killed in a rollover crash on the westbound 10 Freeway in Arlington Heights.